New member here and finally got to see the B &W version of one of my favorite wallpapers of all time. I realize that it's slightly a year later but I have to concur with the review that Jason submitted. Very spooky, very cool! Holy cow, I just noticed the black and white version you added a couple of years ago. Very cool "old horror flick" feel to it. Nice touch! I adore that black and white version (bwcastledracula1). Reminds me (as I'm sure was intended) of the classic horror films. So very, very awesome! Definitely a favorite. I really like this one. :) Very suitable for Halloween. Why is there no 960x854 resolution under Members Mobile? That's the one I use on my Motorola Droid! Well after two rubbish tries we got a version worth using - phew! Just in time for Halloween. As exitstglef said though; dual screen keeps the focus right at the point where monitors meet - perhaps you could re-think that in future? Thanks and happy Halloween. OK. We're closer to Halloween now and I've had the dual screen version up for a while. I've noticed some tings in the dark on the right and the grass on the left that really resemble 'hidden' ghouls. I'd swear I see dark faces and bodies in the cliffs on the right. In the hill grass on the left, with a little imagination, eyes, mouth, and... well you get the idea. It is all subtle, but DEFINITELY there,... or is the season really just getting to me? I was just going to post something about the focus on the dual screen renders, but I see that exitstglef just beat me to it. Ryan, Something to think about.... The next time you do dual screens, try to make the main focus not fall near the middle, if possible. My monitors are not touching each other side-by-side, so this pic really looks less enjoyable. I agree -- I thought the dark figure's glowing eyes in the PJ Dracul V2 were overkill, so to speak, and was happy the main version (my favorite) only had the subtle dark figure. I'm disappointed the glowing eyes were added in the multi-screen versions. OTOH, I love this vender, and PJ Dracul V1. Thanks, Ryan! Love both the official and the first pickle jar version. The lightning and storm cloud, something just doesn't seem quite right, but really do love the other two, these and dark wings are my favorite Halloween pics of yours. Love both v1 and v2 of this one, but the Dual-screen version has the main elements centered right in the middle of the frame. This means the castle is split in half by screen bezels and kind of ruins the picture. I took the tri-screen 5760x1200 and cropped it to just the left hand 3840x1200. I felt like this was a much more ideal layout, the right side screen ends up almost the same and the single single screen version, with the added cemetery detail on the left side. what's up with the glowing eyes in the dual? +1 on the glowing eyes in the single screen. Also, it would be great to get the second zombie to render properly as well. Even so, one of the best Halloween themes from Ryan ever...! Nice work Ryan. Good to see a holiday piece rank so well. Just noticed the 2nd zombie didn't render properly in the single screen. Nice work again Ryan. In the dual-screen version, why are there two DB logos? The third version is my favorite - I'm not sure what I'd change. It's more ominous than the other two. Fantastic job, it captures the essence of Dracula very well! Love v1 and v3, thought the blue lights in v1 did look a bit incongruous. Dualscreen please? I love the detail. It looks so real it's actually giving me the chills. Relatively superfast ability to put ideas on canvas, instant patron feedback, producing superfast developement of multiple updated pieces. Ladies and Gentlemen I present to you: The Pickle Jar! This would be even better in dual or tripple screen! V-2 was my fav, though that's because I'm 59 now and "over-the-top" reminds me of how I saw Halloween when I was young. Keep up the good work! V-1 Love the cold feeling, how the light hits the castle, shows off the balcony, the bats are fuller, I like the more pristine graveyard, goes along with the castle being in good shape, the questionable figure by the bridge in the graveyard, is it the living dead or just a tombstone... plays with your mind adding to the creepiness! The blue lights just don't quite fit, much improved with the torches in V2&3. Only the 2 best things in the world, put together, in one over the top masterpiece. I like the other ones too but I'm pretty bias toward V2 :-). The versions this round are spectacular by the way! All three are winners! Thanks for always supporting my favourite day of the year. I agree that V3 is an excellent mix of all the great things about V1 and V2. Any chance for a multi-monitor version? You've nailed it! I absolutely LOVE the way the mist on the ground merges into the clouds in the background and make it so that you're not sure if the castle is actually sitting on anything solid! Thanks so much for the variety here! I believe the first render would be perfect with the blue lights changed to torches, a little bit of a blood moon, and the zombie dude. Those 3 subtle changes to your first render would be right on. It's got an expansive and desolate beauty to it, with an even 'elegant' fearful quality. Love it. I am sticking with V2. "too much of everything is just enough!" I have been a member for years and while I realize that the tecnology is improving, I also believe that I can detect the maturation of Ryan's gift for composition. These pictures are continuing to improve and become more compelling! I check back several times a week in order to catch the latest! People are still constantly amazed by the quality of the images that I display on my work desktop! I like the feeling of the 1st version the best. That, and the graveyard seems to have blended into the background a bit on the 3rd version. Maybe that was intentional, as to not take away from the castle, but it was a great feature. Version 3 definitely takes second place, as like some others, I wasn't a huge fan of the lightning in the 2nd one. THAT was distracting. Heh. I still think I like the cold feeling of the original the best, but this 3rd version comes in a close 2nd, and well above the 2nd, more melodramatic version. This just became one of my favorites, Halloween or otherwise. 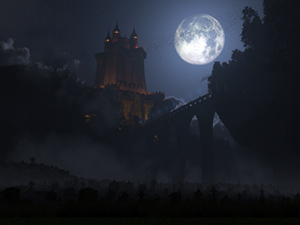 There's so much going here: the imposing castle, the mist-enshrouded forest, the long forsaken graveyard (complete with a lone zombie),the haunting moon... everything! All three variations are fabulous work! uau! The moon is awesome! the graveyard as well! the lighting on the other seemed to bright Ryan! nice version... love this one and the original one! The warmer colors along with the lightning makes this look better than the original. I love it. #1 seemed more desolate. But this one is pretty cool still. Looking forward to a triple-head version of either. I like this one the best. It has a decent sense of drama without being completely over the top (like #2). The only thing I would want changed is to make the flow of bats more thick as in version one, because thats how migrating groups of bats actually look like. Even without that changed it still looks fine. Other than that this looks great and has much improved since version one. I tend to like #3 the best (it seems to have the right balance of elements). I showed these to my wife, and she likes the moon of the #1 better than #2 or #3. And with the amber color of the torches and lighting of the castle, the amber color of the moon might be a tad too much amber now that I think of it (I guess my wife is good at judging some things after all!) I think if you take the moon and graveyard from #1 and put it in version #3, you'd probably have the wallpaper that would please about everybody. I still prefer the first one to be honest, but this third version is cool as heck. #3 has the right combination of elements to reall tell this tale. Great job Ryan! Third is definitely the best of the three. I vote for Version 3. Were you inspired by the Castlevania video game series? FANTASTIC. Version 3 has the extra evil from #2 without the "too much, looks corny" problems of 2. LOVE #3. It will be my Halloween wallpaper for quite awhile! I like them all, but I think the 2nd version is my fave. It will definitely be on my monitor as Halloween approaches...Mwuahahahahaa! The best hands down in my opinion! Much more balanced, though I think the original silver moon might give a more interesting light play now there's the firelight in the castle door to contrast with. I'm saving all versions: it's a great scene whichever way you look at it. All three versions are great! But I personally like the first one the best, it feels like a movie scene, something out of a book, this is how I imagine the castle of Dracula. But I think that for Halloween the third one is more suited, because of the orange moon, the crooked trees, the whole scenery with the graveyard dude, it just fits better! So go for the third one for Halloween! I still like the ordered neatness of the original graveyard. This on looks more like it's just a field full of rocks. I still like the original. Like them all, but this is my favourite. I do wonder how it would look with a silvery moon, then again it may not work as well as the orange. If you want 1680*1050, just download the 1920x1200, it scales perfectly. Versions one and three are my favorites, you did a great job with this and I love the lights along the bridge going into the castle. I joined for your Halloween images, and you don't disappoint. I wasn't in love with the first version, and I thought v.2 went too far the other way. This one is perfect - well done!!! I like parts of all the versions but I think the 1st is my favorite. Has the creepy feel that one would expect from Dracula. The later versions are more like Frankenstein. This is my favorite of the three, though I'd still love to see the ghoul's red eyes in this one. The color seems more uniform without the lightning.. To flip it, with the lightning, the color scheme of v1 I think would look much better.. Great job! My votes for v3. Gives me the shivers. This looks way better than version 2. The clouds and the color added by the lightning just don't fit the scene for me. Would also like to see this resolution. I have been visiting this site for a decade, maybe more. The lightning version in the Pickle Jar is quite possibly the most dramatic wallpaper I have seen on this wonderful site. Thank you for your incredible talent and my new Halloween favorite! Ryan, both the V2 and V3 versions of this piece remind me of some of the artwork style from the 2nd Ed books for D&D. :-) Maybe you're actually depicting Castle Ravenloft without knowing it. BTW, I think you missed posting the 1680x1050 render of V3. V3 is the best one. the trees, the moon, the 'undead' like figure in the foreground, the texture on the gravestones.... all perfect! I *REALLY* like V3, although I think the moon may be a tad bright. It is much better than v1/2 IMO. I'm leaning towards the first render, because of the more muted feel. Although I do like the humanoid creature (perhaps a zombie) that's in the later ones. I've added a new version this evening that somewhat splits the difference between the first and second render. I may have more to say about it tomorrow but I wanted to post it for your review before I went to sleep. Good night all! Great job on this one, second edition is very spooky. Loved the changes except for the lightning. Took it too over the top for my tastes. I do like version one a lot, so that will have to do for my Halloween wp this year. I forgot to mention how much I look forward to your Halloween wallpapers each year. I think I look forward to these more than any other type! Some favorites are MTrooper2K5, Night Children, All Hallows Eve, and Darkwings. Hey Ryan, I really like the castle much better...it has that older look and I love the addition of the ambient lighting. I see your point about the "Dracula is his prime" look with the first one...I hadn't thought of that. It's a good idea too...and certainly less explored. I really like this version, personally. You've done a great job. This is more like Halloween! If I were to give it a score, it would be a 9.5. If the lightning was just one "streak" going across the sky (and not several streaks going around the castle itself) and maybe if the bats were more defined, I'd give it a 10! Other than that, it's perfect! Is that the "Count" himself in the graveyard with the "burning" eyes? Love it... The lightning and the colour of the moon add the sense of drama that was missing from the original. I like it, yes there were alot of changes, but they were good. If I were to change anything, the orange moon, would seem to be the one thing I would change, and maybe just not so orange. Ryan you do great work! Wow...ummm massive change form the first version, which was next to perfect. Think the lightning and clouds are way too much, almost makes it look like a cartoon. I think the moon would be better less orange. That was actually my favorite part of the first one, where you could clearly see the definition of the bats crossing the moon. If you do end up keeping it like this, would it bee too much to ask for a dual screen render of the original? I was one of few who said no revisions were necessary but I love it! It's a whole different mood than the other one and that's great. Two different contrasts are a good thing. I'm very pleased with this version as well as the original! Personally I'd have stayed with the original but taken the orange sky from the second. I'd have also ditched all the lights on the castle as less is more I think. A dark shadow of a castle leads more to the imagination. Keeping the pickle jar image on my desktops - everyone here seems to like it - that says a lot and why it got such a good rating! I think the lightning is great, but i'm not a fan of the color of the moon. I think I'd like the old color of the moon better. That said, for that color moon, I'd probably eliminate the lightning.. Or, maybe turn it more of a blood red and have the lightning taking on a reddish color. Hard to say, there's a lot that could be done.. I'd lose the ghost though. For one he just looks weird and it took a few minutes to figure that out he's transparent, but mostly because that kind of thing is implied by the mood of the image. At the least he shouldn't have glowing eyes :P too cliche! I just saw the movie and didn't notice the wallpaper. I like your halloween pictures alot. Specially this one. The first version was great and the second is amazing. But the lightning is distracting and not necessary, because the castle matches perfectly with the bridge, moon and tombs. It makes me think of Frankenstein more than Dracula. The bats aren't pronounced enough. The lightning is too pronounced. I think the lightning should be more in the clouds if any at all. Would Dracula stay in on stormy nights? Why is the moon orangeish-red? I love the orange moon, it is fantastic and it really lights up the picture in a cool creepy way. But I'm not too fond of the purple lightning, it pulls you away from the other great elements and sticks out awkwardly. Perhaps it is a bit over the top, but that is what I feel makes it a perfect background for the 'festive' spirit of Halloween! Each version gives off a completely unique impression of the scene, I love when you post multiple versions of an image! Pseronally I think this graveyard, with it's quiet neatness has a more eerie quality than a jumbled up one. If anything should be crumbling, it should be the castle showing signs of great age. And I think the lightning distracts from them the quiet eeriness too. And no need for zombies or ghosts. They are implied! I do like the moon, but maybe a bit too orange, as is the entire scene; more towards red might be better -- the color of blood and all.... It seems just a little too messy and cluttered, compaired to the other one. Sublety is the trick. I would really really like the second version more if you could loose the bright white purple lightning epicenter. It completely overpowers and distracts. My eye is constantly drawn there. I love the orange lighting, purple clouds, and the revised graveyard with shade. It's very cool. A lot of people are complaining that it's too much like Dodenfell, but I love this version (then again, Dodenfell is one of my favorite wallpapers so...). I love the color contrast with the orange moon and the blue/violet lightning. However, there is an error with both versions. V1 has a bar of green along the bottom, and V2 has glitches in the bottom right corner. Seems that there is some sort of random effect that is making the non lossless image blend together like an underexposed photograph. Love the lightning, but the clouds could be more transparent I think. And the zombie. Needs about 4 more. That is all the suggestions that I have for now. I would really love to have a multiscreen version of this. When can we expect one? I have to say... well done! This version looks a lot more like Halloween. The first looked like Dracula's castle on a warm summer's evening. The disarray in the graveyard, the dead trees, the redness of the lighting. PERFECT! The one nitpick I would have is with the lightning. It seems to distract too much. I would suggest removing the stormcloud and lightning and replace it with heavy wispy clouds drifting across the sky/moon, but that's just me. Good work once again. This one seems a too busy rather than campy/over the top evil.... too many elements that don't seem to gel together. The only thing I would have like added to the original would be a pack of wolves in the graveyard since that is a part of the Dracula mythos (more so than Zombies, which normally I'd love). I like the first one better, I really don't like the orange moon. I like really dark and creepy Halloween pictures, the first was closer. Also in the pickle jar version there is a band of green at the bottom of the picture for numerous resolutions. I like the first version better -- it was cold and spooky. But, I like both.. and for a good effect I use version 1 as my iPad lock screen, and version 2 for the iPad home screen.. almost like going from a black & white Bella Lugosi Dracula movie to a modern one.. Very cool as always! Not sure if I like it better than the first one. But I do like that I can choose either one. This 2nd version is just a bit too flashy and campy for my tastes. It's neat, but the 1st version had a humble, eerie, quiet to it that I appreciated. The 1st was just more subtle and elegant. I honestly cant make up my mind. Each has its own quality that makes it great in its own way. Well done. If the intense lightning is kept, it's surely got to catch the trees, gravestones, etc - and probably needs a spooky, shadowed foreground figure to backlight. All of which would further reduce the castle to background. As Gregor pointed out, the Clouds and Lighting is too much Dødenfell to the piece. Maybe some type of softer and misty Clouds would work better? Other than that i love the changes. There is something Stiring in Dracul's Castle on Halloween. Sometimes the longer you work on something the more you want to change. Feel like the orange lighting is too much. The scene is too bright now. agree with others that the thunder cloud overpowers the creepyness of the original castle. the blood moon and the zombie is great. maybe more walking dead coming from the ground or out of the castle...none the less this is gonna be a great halloween theme, thank you for being brilliant! the first thing that came to my mind: this is far too much! the moon would have done well, maybe with a more blue / white finish. but the lightning, which instantaneous reminded me of "Dødenfell", doesn't fit in! imho the scene should be much darker, with more imagination left to the observer! Much better! This one pops! Like the tree thing on the left. Castle lighting is better. Interesting changes. Personally, I like the changes to the trees, and kind of the moon, but the lightning is over the top for me. The foreboding castle is overshadowed by the lightning now, detracts from the overall scene. Maybe keep the dark clouds, but not the lightning? The orange eyes in the graveyard are ok, but if there were multiple sets of smaller red eyes, that would look better, imo. There's too much going on in the picture now. The moon could shift to red, as well, so it doesn't overshadow the orange/yellow of the castle's lights. Absolutely Love it Ryan. Truly enjoy your eerie Halloween themes. Have both versions. I much prefer the first version, feels like there is too much going on here...a little too intense. The first one has got a subtle spookiness that makes it...well much more scary than this overly evil version ;) I think just changing the moon, torches, and the zombie would have been enough to perfect the first one. I have this one tiled across my 3 screens now.. But.. It would look awesome in 5760! I'm looking forward to what tweaks you are going to attempt with this. This one is on my desktop as well as my phone. Love this wallpaper, it make over take Dark Wings as my favorite Halloween wallpaper. But I got to ask, is there a zombie in the graveyard under the bridge? I noticed this weird looking tombstone that doesn't look like the others. Every year I anxiously await the Halloween and Christmas images. This is by far the best of either genre. Can't wait for the triplescreen. The graveyard is my favorite part of this piece for sure. i noticed on the second look but when i did i got goose bumps, well done! also quick question are the blue lights pillars or are they people walking with long torches? Stay tuned for an update to this piece coming shortly. Lots of great suggestions! Dark Wings is still my favorite Halloween, but this is really great. You should do a blood moon for it. That would amplify the overall eeriness of the scene. When are the dual screens due out? I want to go to this on my multi screen setup! Great job Ryan. Really puts me in that Halloween frame of mind! Might look cool with the blood moon, just a tad of orange. The blue lights make it look like Dracula 2100 or something too futuristic, Regular torches would make it look more time appropriate. They remind me of something from the Protoss from Star Craft. Personally I think You designed the castle well, no windows to let light in, the castle in good repair... I couldn't see a smooth talking seductive creature living in a decrepit castle that isn't well defended. I think a new moon instead of a full moon would be creepier. I think this is your best Halloween image yet. I agree with Michelle's comments, I don't think anything should be changed. I'm running 4 1600x1200 monitors in a 2 x 2 configuration...be great if some of this stuff was rendered that way. Maybe the castle should look a little more run down. It's centuries old, after all, even in the 19th century. I'm amazed at the detail in this piece! Adding some creatures to the graveyard in the triple view might work but other suggestions show just how you're work has sparked our imagination. I think additions/changes to the bridge or castle would detract. Thank you Ryan for adding art to the season that will set the stage for a super-spooky Halloween! Don't change a thing! *Please* don't change it Ryan! The monster you don't see is far scarier than the one you do. I love the foreboding, the angle, the lighting. Anyone who has read Bram's Dracula knows the fellow isn't all fang and blackness and claw. He's more subtle than that. And this catches that uneasy, hair-pricking, something isn't right but I don't know what, that Dracula possess. If you make a tri screen of this, there soooo needs to be some zombies and other things in the grave yard. Maybe even a werewolf on the bridge howling at the moon. Just some thoughts. Love your work Ryan. Really enjoy the imagination. Maybe incorporate the 2005 Midnight Trooper or other previous Halloween images into this one. But keep it a bit stealthy so it doesn't take away from the overall picture. I love the idea Ryan. I'm just thinking that the castle looks too new and is too well lit, considering this is supposed to be the sanctuary of the centuries-old evil King of the Vampires! If you think about the images of Dracula's castle that we're all accustomed to from books and movies, it always looks older...more sinister and in ruins. Also I think the blue lights look too cheerful and warm. This is after all a place only the undead live! Don't take me wrong...I love the idea. These are just a few ideas I would incorporate. Definitely spooky. My new wallpaper for my laptop! Perhaps add a few taller tombstones, maybe a one or two with statues of an angel (or is it an angel?!?). + another for torches on the bridge! Me personally I think this would look better in just Grey, Black, and White. I got the idea after when I was shutting down XP, you know how the screen fades to grey, black, and white until you make a selection. I saw that and I was like hey that is how it was originally done, the old horror movies. Can't wait for more multi-screen versions of ALL your art! I totally agree with those who says the lights on the bridge really doesn't fit in. Maybe you could have a row of slaves (food) walking towards the castle, guarded by some of his servants, who also carries torches with them?? I think that would look really, really nice. Either way, some kind of torchlight would be nice, instead of those dull blue lights. I've also seen some suggest a blood moon,which I'm not really sure would fit in, but then again, it's hard to say in advance... though I think at least a picklejar version with a red moon would be neat! Like many others have also pointed out; you don't really pay that much attention to the tombstones at first, so getting them more into focus in some way would mean a lot. I too, also like the idea of either a vulture with glowing eyes or a grave digger carrying some kind of light to really put some focus on the tombstones. 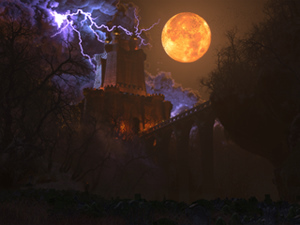 Someone also mentioned Van Helsing somewhere in the comments, which made me thinking that maybe a werewolf with glowing eyes looking over his shoulder (his body turned towards the castle), placed in the foreground (at the cemetery) could also look pretty cool! Beside from this, keep up the good work (cus your awesome). And I'm looking forward to see the final result of your work! My only suggestion would be maybe a bit more of an orange theme to it. I realize that may take away from the castle (which looks great) standing out, but it would do more to portray the Halloween theme. Would a vulture sitting on a headstone in the foreground be easier to do than a gravedigger? Love the concept but this needs a blood/hunter's moon. The foreground needs illumination because the graves are obviously the scariest part. I think a red glow coming off the moon could create an eerie effect. That eerie factor is exactly what this piece is missing. I think you've lost contrast here. Lots of grays and seems washed-out. Aren't there other techniques for you to simulate distance and fog? I love it when you post an early version of an image and ask for feedback! 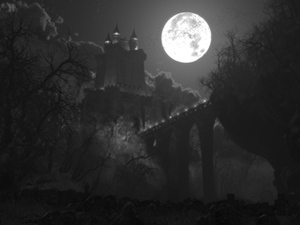 *The moon seems too bright and draws my attention away from the castle which is the more interesting piece. *I didn't even notice the graveyard on the bottom until after looking at it for 30 or 40 seconds. *Agreed with comments below about wear and tear on the bridge but I like the trees healthy. There can't be a Dracula Castle without any lightning around, that's an unwritten law lol. Ryan, First off great looking piece! Cant wait until you get a multi-screen done of this one. Put a silhouette of Dracula in a castle window just before he's about to fly up to the other bats and lead them to a feast. Is there a person in the image? I can't find one. I like the grave digger idea. Those lights on the bridge just HAVE to be torches. Those lights plus the way the castle is lit looks very hollywood. Not menacing at all. I agree, a creepy grave digger digging a fresh grave by torchlight would be a great addition to this creepy masterpiece in the making. I agree that he wouldn't bother with a grave yard, but if he is, there needs to be a spooky grave digger digging by lantern or torch like in the movies. Who knows what he is digging? Perhaps there's a fresh corpse next to him. Great piece and just in time for Halloween! If you really want some C&C, I'll have to mention the lighting on the castle. It looks a little plain in contrast to the moon, and you don't get a "striking" feeling that the castle is the centre of attention on your first glimpse. Lovin' it, and it's currently on my desktop too. I can agree about the torches but the first thing I thought was why a graveyard? Would he really bother with all that? Piles of bones and skulls, dessicated bodies and carrion eaters (birds,wolves) wandering through dead trees would be much grosser and can still be dark and non-distracting. Might be too much work but just a suggestion. It's pretty awesome as is. if i could have a castle it would be just like that! nice one Ryan! very spooky! Dracula would be amazed! Love it! Very cool, as below - only thing I could mention would be changing the lights to torches! Pretty much what it says :-) I'd change the lights on the bridge to torches. Otherwise, it looks fantastic! Lovely evocative piece with a great atmosphere. The Fog is cool ,but the clouds must replaced by an other thing. And the moon is a bit bright, it looks to happy all in all.I miss mystery colours. Dude, click on the mushrooms at the top of the page. Takes you to the home screen where all of the main posts are! Keep it! I can't think of anything you should change or add! I love it all! The cemetery, bridge, castle, moon & bats all go together well! Best Halloween wallpaper in a few years! Not that you're past few weren't great cause they were but I like the change of setting this year! Can we get this in dual monitor please? Firstly, I LOVE this wallpaper. I like it a lot more than previous Halloween wallpapers. This breaks new, Halloween ground. I would love to see a sunset version though, or something akin to the lighting in last year's Halloween wallpaper. Rather than just night, as we have here, twilight. Looming darkness. Ominosity. This wallpaper is great, so it deserves some variants. I like it just the way it is...! VERY good work...! One other thing I just thought of as I was browsing these comments is that maybe the architecture of the castle could be changed to make it look less like a militarized citadel and more like a dilapidated castle of a bloodthirsty vampire. Maybe make the sides less straight and add towers that lean or jut out from the rest of the castle with arched, Gothic style windows. It would be quite a bit of an overhaul but maybe you could really take it somewhere. ugh! I miss the normal member content pages =( Can't find your posts on what's going on anymore. Plz tell me you didn't move it to facebook permanently. It would make me a sad panda to not be able to participate anymore. @skazarian - Agreed, but not the Headless Horseman... The Grim Reaper. @dmackoy - Agreed, Werewolf... Just completing Change! @Ryan - Agree with all other suggestions: Kill Trees, Age Bridge & Castle, Tombstone redistribution, Bat Swarm redistribution and density changes, Fog Tendrils. And we need Lightning... No clouds necessarily (after all, it is supernatural). FWIW - It's already my Desktop... Can't wait for the Multi-Screens!!! And Lastly... Love Your Work!!! * The swarm of bats looks too uniform. Add a little fluidity to the overall shape and density distribution of the flock? * The trees are too healthy. Kill them. KILL THEM, I SAY!!! * The fog beneath the bridge is a bit too "fluffy" for me. I think it would be cool if it were a little more wispy or "tendril-y". Not too much, though. * Add some wear and tear to the bridge and maybe the castle. @Ryan - The tombstones thing could just be better monitors. It would be cool if just a few of the tombstones were "chipped" or "broken" like a really old cemetery would be. Maybe the bridge too could have some "missing" stones from the under side. Consider "What would Dracula need with a bridge anyway?" Why not let it fall into ruin. Same w/ the castle - a few missing stones. Give it that really old feel - centuries old. Overall a fantastic concept - I really like it - can't wait for the final (& multi-screen) renders. PS. In time for the big night - you've got your work cut out. Thanks for the comments so far! The cemetary is a bit tricky because I don't want to put anything too eye-catching down there that would take the focus away from the top third of the image. The tombstones are the same models I used for "Dark Wings" in 2009 but no one said anything about them being too low-res back then. Strange! Cant wait to see the finished product. Love the fog on the ground but as you go up it tends to wash out some of the picture. Ever thought about throwing in some wolves or a werewolf in the cemetary? I haven't been too fond of the last couple of your Halloween pics, but his one is great. i have to say, i agree with all the comments so far. my contribution is to suggest a small change to the colour of the castle bricks, i think if they were darker it would add some spookiness... also, maybe some sinister banners flying from the tops of the towers? Love the cemetery, but perhaps a bit more variety in the size in the foreground. The bats leeving the castle needs some altering. As they are, they seem to have been launched by a cannon (an angle and variety to the swarm?). Don't change the castle or bridge. I agree with KRingg below, there is some bad color banding on this image. I especially notice it on the right of the image and in the lighting immediately to the left of the castle. First of all... great image... I really love the layout and the castle model. That said, you're getting some really bad banding in the right half of the image. What should be a smooth gradient is coming out looking like a gradient done in 8-bit color (okay, not that bad, but you get the idea). I assume that's Vue's renderer... but figured I'd bring it to your attention. As this one is in the early stages, I'll skip the token "looks good, etc." and go straight to the areas I feel could use some work. The whole thing looks a little bit too groomed. We're talking an ancient evil castle at Halloween. The cemetery looks a little too well maintained. Perhaps more variation in the size, shape and state of repair of the tombstones. I'm also wondering if the trees shouldn't be a bit more skeletal. The whole scene is teeming with life. I am also wondering if it would work to put more clouds in the sky. Last, for the bridge and castle, they don't look very sinister. They look like any old castle you might find in Europe. As far as how to pull that off, I'm not quite sure how to do it, but I trust a man of your talent can pull it off. The finished product is going to be good. I can tell. First, this is killer! Iv'e noticed in the background under the arches in the bridge....there looks like there are small people standing back in the white fog. I'm sure this is not intentional, however it is way cool. I do agree with Chris that the intricacy in the graves can be improved. It would make this background top notch. You have some time to play with this. Has the potential in my opinion to be the best holiday wallpaper of all-time. Thumbs up! My favorite part about this one is the stream of bats going across the moon. Adds the nice "vampire feel" to it. One thing to note though is the graves in the bottom left corner look like they're being rendered on an N-64. Other than that it is a welcome addition to my desktop.